This is the first single off of Brother Ali's album. For all those feeling the energy and production on this album, pick up this track and bump it! All music and scratches by Ant. 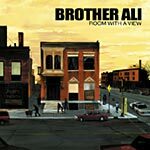 All lyrics and vocals by Brother Ali.